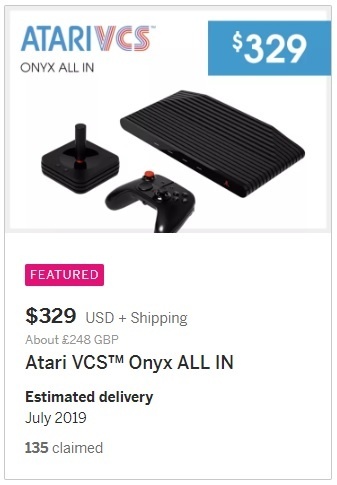 Sure enough, with the annual Games Developers Conference upon us, the outfit behind the nostalgia-baiting Atari VCS has recommended backers don't hold their breath waiting for the thing to arrive. The project still appears to be in the hardware design phase and it's been decided that the machine will now be powered by a "14nm AMD processor featuring high-performance Radeon Vega graphics architecture and two 'Zen' CPU cores". The original "Bristol Ridge" family planned for the box is apparently so 2017, and that shiny Ryzen tech is just too appealing. Oh, and those July 2019 estimated delivery dates still shown on the Indiegogo funding page? Not happening. If you're one of the punters that contributed to the more than $3m raised in order to bask in the nostalgia of something that looks a bit like the Atari 2600 of old then you'll be waiting until the end of 2019 due to "this decision to upgrade". It is almost a year to the day that one of our vultures achieved something backers can only dream of: seeing the machine in the flesh and admiring its lights – because twinkle was pretty much all the mock-up was able to do. We were – how can we put it? – underwhelmed by the experience and representatives' inability to answer even basic questions about what chippery would power the thing. Something, something, AMD. 4K. Linux. You can listen to the whole sorry story here. Demonstrating that you can't keep a crowdfunded retro reboot down, the company kicked off an Indiegogo campaign that was 2,700 per cent funded within its first week by over 10,000 hopeful buyers. You can still join in if you fancy ponying up $239 for the console, or $329 if those retro controllers are also needed. The announcement is a little light on detail, merely pointing out that the new processor includes such innovations as built-in Ethernet and native 4K video as well as running cooler in that Atari 2600-inspired case. As far as what will actually run on it, indications remain that a tweaked version of Linux known as AtariOS will put in an appearance, according to system architect Rob Wyatt. Wyatt also had a hand in the GPU architecture of Magic Leap. What is certain is that the machine will be late. The Atari VCS team has promised to "publish an updated project schedule as soon as we finalize it with the factory and all stakeholders". But will what looks like a mad scramble result in anything?